East Africa is suffering from drought for the fifth year in a row. The rising price of food in the wake of drought has led to tens of millions of people requiring food aid – or going hungry. Hundreds of thousands of cattle have died, decimating the long-term livelihoods of pastoralists across the region. This year south east Asia has suffered exceptionally from typhoons and the flooding they bring. Manila, the capital of the Philippines, received its highest rainfall on record when typhoon Ondoy passed through in September. More than 300 people died and millions lost their homes to the floods. India had its weakest summer monsoon for 40 years, with farmers in the north west particularly badly affected by the lack of rainfall. The weak monsoon was followed in September by India’s worst floods in a century, particularly severe in southern states. Around 250 people were reported to have died as a result of the flooding, with 2.5 million forced out of their homes and into emergency camps. The floods destroyed many of the crops already hit by drought. Kenya, the Philippines and even India still make effectively no contribution to climate change. If their use of fossil fuels per person were reflected across the rest of the world, we would not have global warming. In contrast, this year the UK will emit more carbon dioxide than the inhabitants of what is now called Bangladesh have throughout history. If every country in the world had consumed fossil fuels at the same rate as the UK, cumulative global carbon dioxide emissions would be almost four times higher than they are and we would now be facing runaway climate change. The UK has already used far more than its fair share of fossil fuels. In all, around 70 per cent of carbon dioxide emissions from burning fossil fuels have been made by countries in the global North, despite the fact that they have just 20 per cent of the world’s population. And the North’s overconsumption of fossil fuels continues. Rich countries, with one fifth of the world’s population, continue to account for 55 per cent of carbon dioxide emissions, compared to 45 per cent in the South, where four-fifths of the world’s people live. Campaigners across the global South argue that the UK and others in the global North owe a climate debt. In June 2009 a statement written by southern campaigning organisations on climate debt was signed by 242 organisations, which together represent millions of people on the front line of climate change. For example, much of Peru, including the capital city Lima, is dependent for a large part of its water supply on glaciers in the Andes. But the melting of glaciers means Peru is likely to need to divert water from east to west of the Andes – engineering that will cost billions of dollars. 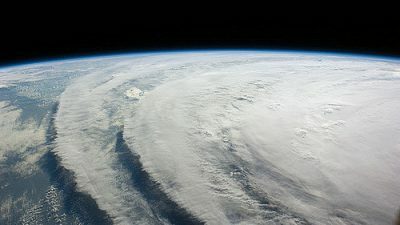 Adaptation debt is the simplest debt to understand: those who have caused the devastation of climate change owe compensation to those on the receiving end. But ultimately this compensation can never be enough. It is meaningless to talk of financial compensation for those dying because of climate change. It will also not be possible to adapt to many of the impacts of climate change, especially the more temperatures increase. Saleemul Huq, from the International Institute for Environment and Development, says ‘it is meaningless to talk of adaptation for Bangladesh’ if the south Asian country is underwater. The increase in temperatures has to be limited. For the past 150-200 years, countries that are now rich have built their wealth and power in the global economy on the basis of using fossil fuels as the main source of energy. If the world is to prevent increases in temperature of 2°C or more, southern countries will be unable to use fossil fuels in the same way. The North’s vast overconsumption of fossil fuels continues to dump enormous volumes of greenhouse gases into the air, effectively using up most of the atmosphere’s capacity to absorb these gases. Now there is almost no atmospheric space left for the South, which means that its option to use fossil fuel energy for much needed development is massively restricted. The statement from southern campaigners says: ‘For their excessive historical and current per person emissions – denying developing countries their fair share of atmospheric space – [the global North has] run up an “emissions debt” to developing countries.’ As well as now drastically reducing emissions, countries of the global North have a responsibility to provide the finance and technology to help the South meet its energy needs, without using fossil fuels. In 1992, following the Rio Earth Summit, the United Nations Framework Convention on Climate Change (UNFCCC) was signed by almost every country in the world. This set out many of the principles that lie behind the notion of climate debt. The North committed to both help vulnerable countries adapt to climate change, while also paying the ‘full incremental costs’ of any measures to reduce emissions in the South. The history of international negotiations on climate change since then is one of northern countries refusing to implement the 1992 agreement. In the run up to Copenhagen, there has been a strong push for a new agreement with fewer obligations for the North, and more obligations for the South. The climate debt owed by wealthy countries can be contrasted with the unjust financial debt the North continues to claim from the South. These unjust debts have impoverished countries both by extracting vitally important revenue and by giving wealthy countries the leverage to force particular forms of development on the South. The climate debt owed by the UK cannot be fully quantified. But a new report by the World Development Movement and Jubilee Debt Campaign has estimated that for the UK to pay a fair share of its adaptation and emissions debt, payments of more than £17 billion a year are required – one per cent of national income. Financial debts of developing countries are smaller. Bangladesh currently pays back £600 million a year to the global North. The Philippines pays £7 billion. In total the South still pays back five times more in debt repayments each year than it receives in aid. Repaying debts is a huge drain on the resources of governments and communities in the South. After the second world war, banks sought to lend money to the governments of newly independent countries, seeing them as a safe investment. As the cold war deepened, governments from both east and west lent increasingly recklessly as a means of gaining political influence. Lending increased in the 1970s due to oil price hikes and exchange rate changes. Money was cheap and lent on to impoverished countries without regard for what it was being spent on or whether it could be repaid. In the late 1970s and early 1980s, with rising interest rates, deflation and falling commodity prices, poor countries experienced rapidly rising debt service costs but were earning less money to pay those debts. In 1982, Mexico effectively threatened to default on its debts. The IMF and World Bank bailed out the banks and took on the debts of developing countries themselves. For the past 20 to 30 years, the IMF and World Bank have used the control given by these debts to impose a series of economic policy conditions, such as liberalising markets and shrinking the public sector. There has been a particular focus on increasing exports to earn dollars with which to service debts. The weakening of governments and increased power of multinational companies promoted by the IMF and World Bank presents a fundamental problem for southern countries in tackling climate change. The need to earn foreign exchange to service financial debts, and the free market conditions imposed by the IMF and World Bank, have led to greater dependence on extractive industries; intensification of damaging farming practices; increased deforestation; and less efficient but more damaging power sectors. None of this is to suggest that southern countries should not be ‘allowed’ to use fossil fuels. But rather that debt and economic conditions have actually led to forms of ‘dirty development’, which have been bad for local people, as well as for the climate. One particular area targeted by the IMF and World Bank has been the expansion of extractive industries: the mining of minerals, gas, oil and coal. Centring economies on the exploitation of such resources has often led to poverty, debt, corruption and misery for the countries concerned. The reckless lending such extractive resources can attract from abroad overwhelmingly serves the interests of companies and wealthy elites and often leads to huge levels of unpayable and unjust debt, the loss of economic sovereignty, and corrupt and unaccountable governance. A study in 2004 found that 82 per cent of the World Bank’s oil extraction projects are for export rather than relieving energy poverty within the country concerned. Furthermore, almost all World Bank projects to finance extraction of gas, oil and coal have benefited northern fossil fuel companies. The Republic of Congo’s economy, for example, is heavily dependent on oil, which accounts for three-quarters of all government revenue. Since the 1980s, banks and oil companies have been financing oil extraction. With the sharp decline in oil prices in the early 1980s, the country could no longer service its debts. President Sassou Nguesso approached oil companies in order to obtain an advance in the mid-1980s. Agreements were badly negotiated, meaning that companies could guarantee massive profits. By 1990, oil revenues had already been mortgaged up until 1994. As the Congo’s debts ballooned, it sought further oil-backed loans. External debt now stands at $5 billion, mostly owed to western governments and institutions such as the World Bank. There has been widespread corruption, with a wealthy local elite making huge amounts of money while ordinary Congolese remain in poverty. Life expectancy is 54 years and the poorest 20 per cent of the population share just 5 per cent of national income. After criticism of the World Bank’s support for mining projects, in 2001 the Bank commissioned an ‘extractive industries review’, led by Professor Emil Salim, former Indonesian population and environment minister. 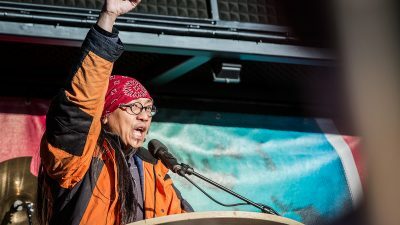 The review reported in 2003, recommending that the Bank phase out funding for oil and coal extraction, increase funding for renewable energy projects and ensure projects get the prior-informed consent of indigenous and project-affected peoples. However, the World Bank refused to adopt the findings, and has continued to heavily subsidise oil and coal. World Bank lending for fossil fuels was higher in 2008 than any previous year in the preceding decade. As well as the burning of fossil fuels, deforestation and the destruction of peat land is also increasing the concentration of greenhouse gases in the atmosphere. Indonesia has the world’s third largest area of tropical forest. In 1997 the south east Asian country was devastated by the Asian financial crisis. Currency speculators had ploughed large amounts of money into countries such as Korea, Thailand and Indonesia, fuelling a boom. In 1997, market sentiment changed and currency speculators rapidly sold their currency holdings in east Asia, causing currencies to collapse. Economies followed them – Indonesia’s shrank by 13 per cent in 1998. The IMF told the Indonesian government it had to implement a number of economic policies as a condition of receiving money in a ‘rescue package’. One condition was cuts in government spending, which stands in stark contrast to the increases in government spending by northern countries in response to the financial crisis and recession of 2008-2009. A consequence of these cuts was a reduction in environmental protection measures, leaving forest resources vulnerable to private operators. Further conditions imposed by the IMF included reductions in export taxes on timber, and the removal of restrictions on foreign investment in palm oil plantations. The ending of restrictions on log exports led to a rapid decline in the domestic supply of timber, exacerbating illegal logging. Meanwhile, the removal of restrictions on investment in palm oil resulted in a rapid spread of palm oil plantations, causing rampant deforestation and destruction of peat land. Peasants and indigenous peoples lost out as companies took away land. Debt, and the economic policy conditions that come with it, have locked in many southern countries to dirty investments that have been bad for people and the climate. The North has to pay off its climate debt if a just and effective agreement to tackle climate change is to be reached. There have been recent announcements from the UK and EU that have sought to indicate they are moving in this direction. In June, Gordon Brown launched the UK government’s ‘Road to Copenhagen’, saying $100 billion a year would be needed in developing countries to help them adapt to climate change, and grow in a low-carbon way. This was echoed by the EU in October, which said EUR100 billion would be needed. But the detail behind these figures shows that the UK and EU are again trying to renege on their debt, and tear up the principles agreed in 1992. The sum of EUR100 billion is far from what the UN estimates developing countries need to tackle climate change. Current estimates are closer to EUR400 billion. Of the EUR100 billion, the EU says that EUR22-50 billion would need to come from governments. But this includes the governments of every country in the world except the very poorest. China, India and the Philippines would be expected to contribute, as well as the EU, US and Japan. Neither the EU or UK have said how much money they are willing to come up with each year. Even if the money from governments materialises, this still leaves EUR50-78 billion to be found. Northern countries, and the UK in particular, are strong supporters of the ‘carbon market’. The main idea behind carbon trading is that rather than reducing its own emissions, the North can pay developing countries to reduce emissions instead. It is carbon offsetting on a grand scale. Even if carbon trading did lead to reductions in emissions in the South, the North is taking the opportunity of double-counting its commitments. Rich countries count offsetting as contributing both to their own targets for reducing emissions, and as meeting their obligation to provide money to southern countries for low-carbon development. Unless northern countries make radical cuts in their own emissions, there is no chance catastrophic increases in global temperature will be prevented. The finance generated by carbon trading flows from large companies in the North to large companies in the South. A large majority of carbon offsets so far used to meet rich world obligations to cut emissions have not resulted in any reduction in emissions in the south. A report by the International Rivers Network found that three out of four offset projects were already up and running by the time they were approved, strongly suggesting that the projects would all have happened anyway. Other than the money from governments and the carbon market, the EU and UK also expect developing countries to pay for some of the costs of adapting to climate change, and cutting emissions, through ‘their own efforts’. Across the world, communities that have done nothing to cause climate change are using their own resources, efforts and ideas to tackle the devastation rising temperatures are bringing. But for countries of the global North to actively renege on their debt and tell southern communities they are on their own is an injustice of scandalous proportions. The UK government has set aside £800 million over three years from the aid budget to pay for adaptation and low-carbon development in the South. Nearly all of this money is being channelled through various funds within the World Bank. By choosing to use the World Bank, northern countries have ignored the UNFCCC, a more legitimate international institution for tackling climate change. With rich countries still holding around two thirds of votes in the World Bank, using it allows the North to control the money. Climate change funds can potentially be used in the same way as development funds and debt cancellation in the past: to exercise control over southern governments. Furthermore, the World Bank is primarily disbursing money as loans rather than grants, adding to impoverished countries’ financial debts while failing to acknowledge the responsibility of the North. Funding for climate change is being seen by the World Bank and northern countries in the same way as aid, rather than as compensation for climate debt. The World Bank’s continued addiction to fossil fuels can also be seen in how it is treating these new climate change funds. The Clean Technology Fund has decided that coal power stations are one of the ‘clean technologies’ it can subsidise. The World Bank views newer, more efficient coal power plants as a clean technology because they produce less carbon dioxide for the energy produced than older forms of coal power. 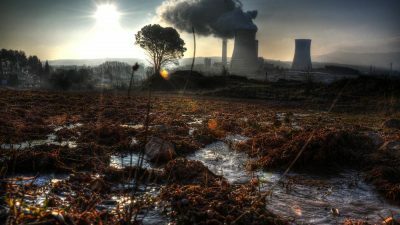 However, these newer coal plants are still dirtier than oil and gas, never mind renewable ways of generating electricity. The World Bank is central to the debates on climate change. Key to just and effective solutions to climate change is the governance of money. These resources should be properly seen as reparations for past damage, rather than aid. As such, there is no reason why the North should exercise any particular control over the finance. Bottom-up governance also needs to be promoted in the use of funds for tackling climate change. Both northern and southern governments need to recognise that local communities need to give their consent, and be actively involved, in low carbon and adaptation projects and strategies. Tackling climate change requires not just scientific and technological solutions, but a change in economic power and wealth relations in the world. The only effective solutions to climate change will be the just solutions. Solutions that reduce global inequalities by ensuring that everyone has the energy and livelihood they need. Solutions that cut poverty rather than increase it. Solutions that make sure the climate remains habitable for all.